Optional factory fog lamps cost $360+. Our 2-function HALO fog lamps outperform, cost less and include everything + installation directions! Quality S.A.E. approved lights offer the performance and brightness of H.I.D. bulbs and have hard-coated glass lenses that pierce through the darkness in any weather condition. 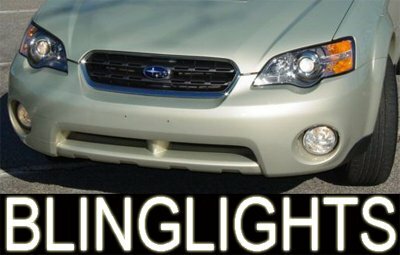 If you're ready to graduate to a higher class of lighting, then take a look at BlingLight's new OE series fog lights with built-in halo rings. The halo ring gives off a cool, even blue glow and the cutting-edge halogen fog light resides in the center. A mini rocker two-way power switch selects between halo ring or halogen driving light. These lights offer the performance and brightness of H.I.D. bulbs and have hard-coated glass lenses that pierce through the darkness in any weather condition. Features an adjustable mounting bracket system and come complete with installation instructions, mounting hardware, relay, wiring, and power switch. Will this kit fit my vehicle listed in the auction title? We have conducted extensive research and have sold hundreds of kits to customers with your same vehicle, with no fitment issues. The lights are meant to mount behind the factory pre-cut fog light holes from the inside of the bumper. Please e-mail us for individual lamp measurements, so that you can measure your front bumper to ensure exact fitment prior to bidding. Does your kit include everything I need? Yes, our kit includes 2 lamp enclosures, powerful H3-55 watt bulbs, fully adjustable mounts for bumper or bar, harnesses, pre-assembled wiring harness with relay and fuse, electronic switch, mounting hardware kit, installation instructions, and more. Can I hook the lights up to my factory light switch instead of the included switch? Of course, just run the wire to the factory switch instead of the included switch. The included switch can also be substituted with other switches found at Radio Shack. What type of bulbs come with your kit? Two powerful H3 bulbs with an output of 55 watts a piece, 110 watts total! These bulbs are designed for maximum output and durability. The bulbs generally last many years without the need for replacement. There is a good chance the bulbs will outlast the life of the vehicle. H3 replacement bulbs are a common size bulbs and can be purchased through us by clicking here or anywhere else automotive bulbs are sold. How do I pay by credit card? Once the auction is over click on one of the credit card pictures on the bottom of this page. Just enter your credit card number and auction information. That is it! I was at my Nissan dealership to get my Armada serviced. While it was in the shop I walked into the parts department. I asked if there was anywhere that I could buy floor mats to protect my new suv. They recommended BlingLights. They ordered and installed them all within 48 hours. All I can say is Wow. They are perfect and cover all 3 rows and the trunk at a fraction of the cost of the factory all season mats. I will definitely do future business with you. ü Customer satisfaction is guaranteed. ü For customers, if for any reason you are not satisfied with your merchandise, please e-mail us as soon as possible for us to make arrangements for an exchange or refund. ü Returned merchandise must be 100% unused by any trials, testing or other signs of wear. ü Buyer is also responsible for the shipping cost for sending it back. ü Shipping fees are non-refundable. ü The refund will be issued as soon as the product is received back and verified to be in proper condition. Best offers do not include shipping. Happy Bidding and good luck!